Narcissa Whitman, trail-blazer and martyred missionary, is one of the great heroines of the frontier West. In 1836 she and Eliza Spalding, following the north side of the Platte on horseback, became the first white women to cross the American continent. The Protestant "Oregon Mission" was composed of Dr. Marcus Whitman, Rev. Henry Spalding, their new brides, and William Gray. They traveled from New York to Otoe Indian Agency (Bellevue, Nebraska), then joined an American Fur Company caravan led by Thomas Fitzpatrick. From the Green River rendezvous they journeyed westward with traders of the Hudson's Bay Company. 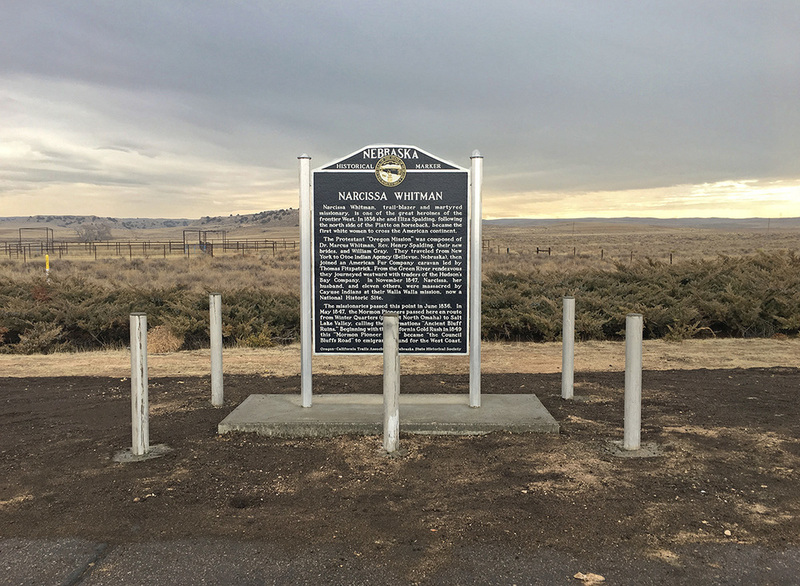 In November, 1847, Narcissa, her husband, and eleven others, were massacred by Cayuse Indians at their Walla Walla mission, now a National Historic Site. The missionaries passed this point in June, 1836. In May, 1847 the Mormon Pioneers passed here en route from Winter Quarters (present North Omaha) to Salt Lake Valley, calling these formations "Ancient Bluff Ruins." Beginning with the California Gold Rush in 1849 this "Mormon Pioneer Trail" became "the Council Bluffs Road" to emigrants bound for the West Coast. “Narcissa Whitman,” Explore Nebraska History, accessed April 19, 2019, https://mynehistory.com/items/show/361.